You can see that I’m sweeping just past my shoulders. In the below photo, you can see how close my hands get to one another before I begin the outward sweep again. I think sculling is one of the best drills a person can do to enhance their feeling for the water – plus it can be done by anyone from the novice to the most elite triathletes/ swimmers. There are different ways to scull ranging from hands up front, hands in the middle or hands by the swimmers hips. It is also possible to scull on your stomach or your back (or even other positions). In this post, I will be focusing on sculling with the triathlete/ swimmer on their stomach and with their hands up front. Lay on your stomach in the water with your arms fully extended. Lift your head above the water line so you can see your hands and breath easily. In a sweeping motion, press your hands outward. Once they are just past your shoulders, change direction and press your hands inward. Keep your hands in line with your wrists and your wrists in line with your forearm. Make sure your hands are below the surface of the water. Each hand will be moving in a pattern similar to a figure 8. I use my middle finger as a guide because either side of my hand pivots around it. Don’t kick anymore than it takes to keep your balance. The more you isolate your arms, the better. Focus on the way your forearms feel as they sweep against the water. Play around with your pitch and angles to see what feels most efficient. You can also change the speed at which you scull. Sculling is most efficient below the surface of the water. I would guess that my hands are between 6″-8″ below the water’s surface in the above photo. Sculling is different than a breaststroke pull! I grew up a breaststroker….to this day, it’s faster than my freestyle even when I swim at a easy pace and I think it’s because I just have a better “feel” for the water from years and years of doing breaststroke drills…..its very much like sculling and I obviously swim breast whenever the opportunity presents itself during practice and as I tire during longer OWS/races….a rest and I don’t fall off my pace. I know so many people that loathe the stroke, but I certainly find it’s nice to have a few to turn too…and like sculling, it really helps gain a good feel for the water! 🙂 Now if I could just get my freestyle speed to match that of my breaststroke I’d be overjoyed!! Oh, that is crazy! Awesome for your breaststroke though! I was a 50 freestyler first but the 100 breast was my next best race. 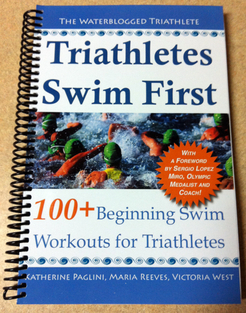 I also like doing breast drills and sculling – and now that I just swim for fun I can do them as often as I want! I think breaststroke is great for triathletes because it gives them another way to get their head up to sight and also can help save energy if they’re struggling in the water.